Edwin P. Alexander (1905 - 1981) founded the American Model Railroad Company in 1927. Prior to that Alexander was an agent for custom model builders Fred Icken, Paul Egolf and others during the 1920's. 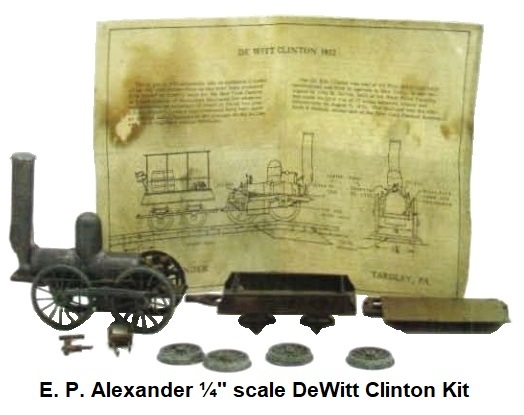 Ed Alexander was a pioneer 'O' scale producer and custom builder of industrial scale models. As a custom builder Ed produced many industrial models under contract both in ¼" and ½" scale. He experimented with HO gauge models in the 1920's and is accredited with building the first known HO gauge American locomotive, the PRR DD-1 electric. Ed Alexander was one of the first to establish a mail-order company specializing in 'O' scale locomotives, cars, structures and parts. 'O' scale Locomotive kits included a 4-4-0 American type switcher, a Reading P-7 4-4-2 Atlantic, a Pennsylvania 4-6-2 K-4 Pacific type, a 4-6-0 Ten wheeler, a 2-8-2 Mikado, a 4-6-4 Hudson, a 2-8-4 Berkshire, a Pennsylvania M-1 4-8-2 Mountain, a 2-10-0 Decapod, a 4-8-4 Pocono, and his famous Alexander PRR GG-1 electric. Classified ads in "The Modelmaker" magazine from March of 1927 contain the initial listings for what was described as 'OO' gauge parts from E. Alexander of New Rochelle, NY. These included cylinders, wheels, domes, chimneys, passenger and freight trucks, finished cars and locomotives built to order, model railway supplies, and 'OO', 'O' and 1 gauge locomotive parts. Publications such as "The Modelmaker" contained no references to HO gauge prior to 1931. All scales smaller than 'O' were always called 'OO'. In this same issue, Ed Alexander was the author of a feature article with illustration titled, "An 'OO' Gauge Passenger Coach." The article described and explained how to model in scale the Pennsylvania RR P70 coach using wood for the floor and roof, rubber for the vestibules, fiber board for the sides, and mica for the window glazing. Roof ventilators were small round head screws and washers, with the screw heads being filed down. The underbody details were achieved by using wood for the battery boxes and brass tubing held with staples for the air reservoirs. Scale steps were made by building up sheet brass and wooden blocks. Air and steam pipes were wire with a small blob of solder on the ends to represent the connection. Trucks were English type modified to simulate American type. The car was finished in lacquers and lined and lettered in oil colors. This car could barely negotiate the standard curves. Even though Alexander called it 'OO' gauge in the title of the article, from the dimensions stated it was clearly modern HO, 3.5 mm scale. In the October 1927 issue of "The Modelmaker Magazine" another article authored by Ed Alexander was published. This was on how to model the PRR DD-1 electric locomotive, listed as 3.5 mm scale but again labeled as 'OO' gauge. At the end of this issue appeared the very first full advertisement for the newly formed American Model Railway Company located at 111 Franklin Avenue, New Rochelle, NY. Offered for sale in the ad were turned brass 'O' gauge mounted locomotive bells for 40¢, a correct scale 'O' gauge whitewood roof section for passenger cars at 2¢ per inch, whitewood floors for passenger cars at 1¢ per inch, whitewood roof sections for 'OO' gauge cars at 2¢ per inch, whitewood floors for 'OO' gauge cars at 1¢ per inch, whitewood solid box car sections for 'OO' gauge at 2¢ per inch, their 14 page illustrated model railway catalog for 35¢, a Leed's Models catalog also 35¢, and the Egolf Scale Models illustrated list for 15¢. The ad listings for 'OO' parts are today interpreted as early HO products and are considered to be the first American products ever marketed in any scale smaller than 'O'. In 1927 the specifics of scale and gauge nomenclature was not clear or settled, and there were not very many products offered for modelers. Appearing in the February 1928 issue of "The Modelmaker" magazine was an ad for the American Model Railway Company of E.P. Alexander that included the PRR P54 coach and 70-P tender, again listed as 'OO' gauge, each selling for 35¢. An ad in the January 1929 issue of "The Modelmaker" magazine from E. P. Alexander/American Model Railway Company lists ⅝" items imported from Britain. The ad stated that this was a special shipment of parts that were not listed in their catalog, and that, "these articles were unusually obtainable in this country and we offer them in the hope of accommodating those interested in this popular small gauge." The ad stated that it was all tinplate, and included complete sets that were a circle of track (12 pieces), 2 cars, a loco, and a control track section for $4.75. Also listed were 2-4-0 Tank type locomotives in LMS red or green livery for $3.25, 2 pieces of straight track for 25¢, 2 pieces of curved track for 55¢, switches for $2.50 a pair, crossovers for 75¢ each, turntables for $2.40 each, road crossings for 55¢ each, engine sheds for 85¢ each, signal boxes for 20¢ each, stations for 45¢ each, 4-wheel baggage cars for 25¢ each and 4-wheel open wagons for 20¢ each. The British ⅝" gauge products appeared again in another E.P. Alexander/American Model Railway Company full page ad in the December 1929 issue of "The Modelmaker" magazine. "a new addition, an 'O' gauge working steam model of the 'Timken Locomotive.' This, the second edition of the first scale model railroad catalogue in America has been planned to list as much material as possible for those interested in the best of hobbies - Scale Model Railways. While our first issue listed but little in the line of finished models and construction sets, it will be noted that these are now included. Although we have gone into 'O' gauge thoroughly, we now also list parts for ½" scale and the 2½" or 'Standard' gauge. Those who have the first catalogue will recognize the considerable amount of new items we have added to our stock. We trust we shall thus be able to help our patrons better and more completely than hitherto." "The drawings are by far the most complete ever prepared for a quarter inch scale locomotive and consisted of seventeen prints for the engine alone. Every part has been especially designed and none improvised from stock to fit, thus assuring the builder of accurate well made parts which will go together without tedious fitting. This is a model which despite its imposing appearance, can be assembled by even a novice (if handy with tools) while to the more experienced model maker there will be no difficulty whatever." The construction set could be purchased complete, or in parts. The castings and material sets were offered un-machined or with all essential parts fully finished. Price for a complete un-machined kit was $45.50 (locomotive only) or $54.50 (with tender). A complete finished parts kit was $79.75 (locomotive only) or $89.50 (with tender). Individual parts could be purchased as well. The building of scale models is a painstaking and time consuming process. Ed Alexander made and used a good many bronze castings for wheels, trucks, steam domes and other details in his models. The 'O' scale Pennsylvania K-4 and the old New York Central 4-4-0 Empire Express American type locomotive are excellent examples of model motive power. The boiler, cab, and tender tank of each locomotive were built up from sheet brass. The brass was shaped and soldered over a series of wooden forms, which were removed after the forming process was completed. The K-4 model was complete with a myriad of small details found on the original. Coupling gear, signal control box, valve gear, were all replicated in miniature exactly as they were on the prototype. The power plant on the K-4 was a small, strong, 24 volt AC electric motor placed in the fire box and hooked to the drivers by a worm and gear arrangement. Weight of the K-4 model was nineteen pounds and it could pull a string of twenty model passenger cars or two or three times that number of freight cars. The 4-4-0 American type loco had a an extremely small firebox that would not hold an electric motor. A different power arrangement was used in order to preserve the scale appearance. The motor was actually placed in the tender, and was connected to the engine drivers by means of a flexible shaft. In 1933 and 1934 the Chicago World's Fair "A Century of Progress" Exposition took place. Among the major exhibitors were American railroads celebrating the technological progress of railroad equipment displaying examples of both historic locomotives and those considered state-of-the-art in the depth of the Great Depression. The Pennsylvania RR and Illinois Central RR asked Ed Alexander to provide 'O' gauge equipment. The Chesapeake & Ohio RR commissioned Ed Alexander to design an 'O' scale layout for the fair. He gladly did so in his efforts to promote 'O' scale trains. The layout was 80 feet long and featured equipment representing the C&O, Erie, Pere Marquette, and the Nickel Plate Railroads. Once the World's Fair ended, the layout was taken on an extensive tour of the United States. Sparked by the many 'O' scale models the company built for several railroads (especially the eighty foot long layout built for the Chesapeake & Ohio, at the Century of Progress), a line of detailed locos, cast aluminum cars, signals and accessories were developed. The company incorporated in 1936 as the American Model Railroad Company. Inc. (AMRACO). The 1937 catalogue was the 10th Anniversary Edition and contained 40 pages of trains, track and parts. The cover carried a photo of the Pennsylvania Railroad's GG-1 Electric locomotive pulling a passenger train. Ed had many relatives living in and around Philadelphia and visited them frequently. While there he usually made a trip to the nearby Baldwin Locomotive Works plant at Eddystone to see his friend, Mr. C. C. Elms, head of the Erecting Shop. Over the course of several years this afforded Ed the ability to see a variety of just completed locos. On one visit in 1934 Ed walked into the shop and saw the first GG-1, #4899 (later re-numbered 4800 and known as Old Rivets) in an unoccupied bay, painted,	striped and lettered. He took the opportunity to pace off its length and made a couple of sketches. The tentative dimensions he had marked down turned out to be very close to correct, as he discovered sometime later when he obtained actual drawings. When he returned home he laid out a scale drawing and the first scale model of sheet brass was built from that illustration. The pronounced slope of the ends was the only noticeable deviation. Later, working from the railroad drawings, Ed designed the more accurate scale model that AMRACO brought out in 1936. This was the first ever made scale model of the GG-1. The GG-1 model was a very large engine at over 19" long. The drive was simple and efficient and the loco could coast. Using special double cut worms on one shaft with Micarta gears (11 to 1) and with a reduction from the motor, the total ratio to the drivers was 17 to 1. Delrin eventually replaced Micarta for the gears and this was a recommendation that Ed Alexander made for most 'O' gauge locos. Besides the feature of coasting, the GG-1 was almost silent. The double cut worm shaft could be used for steam type locos such as the PRR K4, NYC Hudson and similar locos as the wheelbase was the same 1¾" as that of the GG-1. The drive was on the end axles and not through the side rods. The worm shaft could be cut and spliced to fit other types of locos. AMRACO built 6 GG-1's for the Pennsylvania Railroad and another 100 kits went to model railroaders. Early in 1939 another GG-1 model complete with Broadway Limited cars was built for an operating display, complete with full catenary for the railroad, and installed at Radio City in New York. Each Broadway Limited passenger car was constructed from 2 aluminum castings which were joined in the middle. The truck sides were bronze castings. Small details were either cast in place, built up from various materials, or they were small castings which were soldered together. This scale model of the Pennsylvania RR's Streamlined Broadway Limted running on the Radio City layout was used as a subject by RCA for a public demonstration of the first televison cameras and TV sets. This all took place many years before TV networks and programming went live on the airwaves to consumers. At the Westchester Model club, one of the two motor GG-1's pulled all the cars that were available; well over 50. The cast GG-1's needed but little improvement, other than the new gear material. Details, instead of being cast integral with the body, (the screens, louvers. window frames and oil water fillers were eventually separate castings. Some castings were lost wax such as the side ladders and pantograph frames. The driving wheels were Delrin insulated for two rail operation, and the pantographs could be used for catenary pick up. This large engine could traverse a 36" radius curve. Ed Alexander also produced a set of cast aluminum PRR heavyweight passenger cars marketed under the E.P. Alexander label to accompany his GG-1 model. These were 'O' scale, 2-rail, 21½" long aluminum streamline passenger cars made of all metal with full details including diaphragms and die-cast couplers. The cars included clear window inserts and were fitted with die-cast streamline trucks with die-cast wheels. The American Model Railway Company put out a 40 page catalog in 1939. Unfortunately the priorities system was in effect and the lack of available raw materials before World War II caused model train production and operations to halt. For the 1939 New York Worlds Fair, Ed Alexander, along with custom model builders Fred Icken and Joe Fischer were asked to provide the 'O' scale trains and equipment to run on one of the large layouts displayed there in the Railroad Building called 'Railroads at Work'. This model train layout was 160 feet wide and 40 feet deep. It featured over 3500 feet of 2-rail 'O' scale track, 500 pieces of rolling stock and 60 24 volt AC locomotives. It also featured 1,000 miniature buildings, 6,000 trees, and used 300,000 feet of wire. Since the trains made their way around a large serpentine route on this layout, they would pass before the audience going in both directions. Cleverly, to create the illusion of even more rail traffic, each side of the individual freight cars were painted with a different railroad herald. Today the few cars surviving from the fair exhibit occasionally come up for auction and sell for several hundred dollars. This exhibit spurred the popularity of model railroading among adults in the U.S. to a very great degree during this time period. In 1941 Ed Alexander moved from New Rochelle, New York to Yardley, PA. There he spent time working as a photographer for the Pennsylvania RR Engineering Dept. through the war years. He also built industrial models of the Broadway Limited for the PRR, and a 20th Century Limited for the NYC. He also modeled a 1" scale vista dome streamline car for the Burlington RR and several others were made in ½" scale for the Budd Company. Later in the 40's Ed founded the Alexander Railroad Museum which featured the Penn Eastern 1½" outdoor railroad. The museum was really a 200 year old barn on his property that housed Ed's extensive scale train collection. When the New York World's Fair closed, the 'O' scale equipment was sold off through Macy's Department Store. Ed was able to re-acquire some of the now historical pieces, which he had made, and they formed an important part of this collection. Other tinplate trains and various railroadania items found their way into the museum over time. In the fall of 1945 Bill Walthers of William K. Walthers Inc. was in negotiations to merge with Ed Alexander's American Model Railroad Company, Inc. Bill believed that as soon as World War II ended, the 'O' scale model railroading hobby was poised for a big growth period. On October 25, 1945, they signed an agreement and stock shares and money were exchanged where Walthers would purchase a 51% interest in AMRACO. Bill Walthers would serve as managing director providing working capital and marketing expertise, with Ed Alexander supervising production as President and COO. Bill returned to Milwaukee and waited for the expanded line of 'O' scale locomotives and cars to start rolling out of the factory in Ed's Yardley, PA garage. A year and a half went by and none of AMRACO's steam loco's or aluminum freight cars were ever delivered or produced. The AMRACO line had not been produced since before the war, and Ed was now devoting his time to other interests custom building, making industrial models, museum models and writing about railroads. In April 1947 Ed and Bill agreed to dissolve the partnership. In exchange for the money that was paid for the shares in AMRACO, Walthers received the patterns for the New Haven Electric locomotive and a half dozen or so freight cars. During the next few years Walthers produced and sold kits for the Stock Car (#3862), the Triple Hopper (#3899), and the container car (#3818). There is no record that the New Haven Electric locomotive or the other freight car kits (Quad hopper, flat car, tank car, drop bottom gondola, and Caboose) were ever made by Walthers. Ed Alexander built scale model railroad equipment for over 40 years. Examples of his work have been displayed in the Smithsonian Institute and in the Museum of Science & Industry. One model that he created for the U.S. Information Service of an 1800's era 4-4-0 cabbage stack steam loco, tender, baggage and passenger cars that was on display in his museum was seen by the sales manager for American Flyer trains. The sales manager thought it would be ideal to reproduce the train for their line and subsequently purchased the model. In 1959 the S gauge train set of the Frontiersman Civil War era locomotive, tender, combo and passenger cars that were acquired by A.C. Gilbert for their American Flyer train line was released in sets that became very popular with distributors, dealers and consumers. This was a significant event in that it was the first time one of the top toy train producers went outside of their own development organization to obtain a pilot model for a new product. Ed Alexander was also a prolific author. In addition to writing articles for many model magazines in the 1920's and 30's such as "The Modelmaker" and "Railroad Model Craftsman" (Alexander also served as a research editor for Railroad Model Craftsman in the 1950's), he authored many books about prototype railroads. These included: "American Locomotives" in 1941, "The Pennsylvania Railroad, a Pictorial History" in 1947, "Iron Horses American Locomotives 1829-1900" from 1949, "The Collector�s Book of the Locomotive" in 1966, "Down at the Depot, American Railroad Stations from 1831 to 1920" in 1970, "On The Main Line" in 1971 and "Civil War Railroads and Models" published in 1989. Ed Alexander was also an early tin-plate toy train collector and along with Bill Krames was one of the 2 founding charter members of the Train Collectors Association, the group that would eventually incorporate as the TCA in 1957 first met at Ed�s residence in late 1954. Ed held TCA Honorary Charter Member number 4. Ed was a Charter member of the NMRA and was given the 1965 NMRA Distinguished Service Award. In 1985 he was inducted into the Model Railroad Hall of Fame. He was declared an NMRA Pioneer in Model Railroading in 1994, and was inducted into the 'O' Scale Hall of Fame in 2000 at New Orleans. Today the models that he manufactured and designed bring excellent prices if they can be found. Newbraugh Brothers acquired the patterns for the 'O' scale freight line of American Model Railroad Company on December 12, 1980. Newbraugh Brothers Toys, Inc. purchased the American Model Railroad Company Inc. from Ed Alexander along with the rights to produce the freight car line he originally started in 1927. Newbraugh had planned to manufacture complete train outfits using the Alexander designed cars molded in plastic combined with locomotives built using patents they eventually acquired from the purchase of Hoge Toys. Nothing was ever produced however. When Ed Alexander died in 1981, Edward 'Ed' Martin Duddy acquired the 'O' Scale die-cast GG-1 patterns, tooling and left over parts, including some cast bronze cab shells from Ed Alexander's widow. 'O' Scaler Duddy founded House Of Duddy in St. Louis, Missouri with his wife, Marge Jolly Duddy, in 1982 when they announced their purchase of the Ed Alexander PRR GG-1, and the line of electric locos including the E-33, E-44, and FF-2 from 'O' scale modeler Bill Wolfer. Over time Ed Duddy made a number of significant changes to the Alexander GG-1 locomotive drive system to improve it by powering all 3 axles in the power trucks and also adding Oilite bearings to each driven axle, and replacing the hub insulated wheels with rim insulated wheels. He kept the GG-1 shell exactly the same as how it was originally drawn and built by Ed Alexander. In order to power all 3 axles, the motor mount had to change, and the position of the one gear that is mounted crosswise to the frame had to move. Even without all of Ed Duddy's improvements, the original Alexander GG-1 is still a fine model. In 1987, Ed Duddy replaced the Alexander underframe with an investment cast underframe with sprung drives, designed by Bill Wolfer. The Alexander classic GG-1 was still available in 1993 through the House of Duddy, and was still an absolutely stunning model. It shouldn't be parked on the same shelf with Lionel however, because it is almost twice as long as most Lionel products.